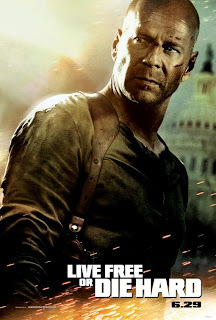 Live Free or Die Hard is easily the most fun I've had with a movie this summer that wasn't Knocked Up. It delivers everything I expected from the series (aside from a few things, which I'll get to in a minute) and never slows down once it gets moving. Here we are, 12 years since Die Hard with a Vengeance, introduced to an older (and decidedly hairless) John McClane (Bruce Willis), who is an analog man in a digital world. After all he's been through, the last thing he's ready to handle is a cyber terrorist (Timothy Olyphant) who technologically cripples the entire country in an attempt to rob it blind. In the beginning of the film, John is dispatched to pick up a young hacker named Matt (Justin Long), who was one of the tech-geeks conned into helping the bad guys. Not being of further use, these guys are getting blown up left and right, and Matt is next on their hit list. What follows is your standard mismatched pairing: a techie and a computer illiterate. Could be a lame buddy comedy, but remember: This is Die Hard. Have faith. Well, it's sorta Die Hard. See, the rest of the series has been stamped with a hard R rating, with plenty of bloodshed and cursing to justify it. To ensure a bigger opening weekend, Fox edited Live Free or Die Hard to a comparatively limp PG-13, and you can certainly tell. None of the people (aside from John) seem to have any blood in their bodies whatsoever, and have also mastered the art of making their mouths not synch up with the words they are saying. Yep, the editing is that obvious. Criticisms aside, this is a solid entry in the series. It doesn't touch the original, which remains one of the best action films ever made, but it's just as good as the sequels. It's far better than Die Hard 2 and about as entertaining as Die Hard with a Vengeance. Without saying f*ck a lot, John McClane is still John McClane. He still spouts the one-liners and can still throw a punch, particularly in his fight with bad-girl Mai Lihn (the hot-as-hell Maggie Q). The action gets a bit cartoony at times, but director Len Wiseman keeps the adrenaline pumping throughout. Especially considering that the movie could have become boring with all of the techno babble. It's still there, but we can at least relate to John: he doesn't know what the hell they're saying either. Sorry to say it, but it's been a weak summer. Movies have run the gamut from God-awful to decent, with Knocked Up being the season's first true surprise. But in the action arena, John McClane is still the man. It's a lot of fun catching up with this character, partly because Bruce Willis seems to be having so much fun playing him. Yippee ki yay, mother(gunshot). I thought they got away with alot of language and violence even with a PG-13 stamp. As much as I love a gore-fest, I was just as entertained with a toned down version. I felt in terms of a plot, McClane up against cyber terrorism just didn't fit with the rest of the films (almost like a McClane in space concept), but its safe to say Bruce Willis did not let us down with an aging McClane.